At Colonial Manor, we provide a comfortable and nurturing lifestyle for our residents who suffer from the progressive stages of memory loss. Our staff is highly trained in memory care, and they work with each resident to individualize their care plan. Our staff works with each resident to build trust, follow simple routines, and build visual cues to make them as comfortable as possible. We work with those who suffer from all forms of dementia, including Alzheimer’s. 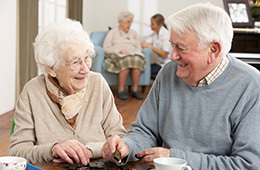 We seek to provide an environment where our memory care residents are content and engaged. Our memory care unit has 24-hour oversight day, and our residents enjoy specialized activity programs. At Colonial Manor we want our residents to feel at home. We offer studio floor plans for our memory care residents. All of our floor plans are designed with our residents in mind.